Sleek, Lumark Navion™ LED luminaire features unmatched optical performance and versatility. PEACHTREE CITY, Ga., August 30, 2012– Cooper Lighting, an industry leader committed to delivering innovative products and driving transformational technology in the lighting industry, has introduced the addition of the Navion™ LED luminaire to its line of Lumark LED outdoor area, site and roadway lighting products. Featuring Cooper Lighting’s patented AccuLED Optics™ system, the Navion luminaire’s unique application-specific design allows lumen output and energy consumption to be customized to fulfill the exact lighting needs of the area, eliminating uplight, glare, obtrusive spill light and overlit hot spots, while saving up to 70 percent in energy costs. 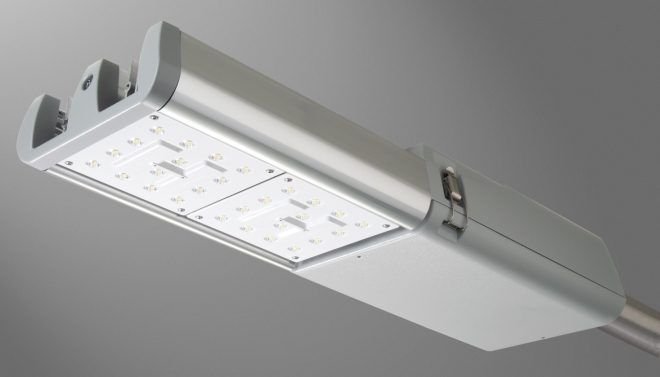 The Navion luminaire meets all ANSI/NEMA standards for roadway lighting. Cooper Lighting has made a significant investment in people, resources and technology to ensure the company provides first-class solutions to its customers’ lighting challenges. The Company offers a range of indoor and outdoor LED lighting products and controls, all of which are specifically designed to maximize energy and cost savings. For additional information on Cooper’s LED product offering, visit www.cooperlighting.com. Cooper Lighting, a subsidiary of Cooper Industries plc (NYSE: CBE), is the leading provider of worldclass lighting fixtures and controls to commercial, industrial, retail, institutional, residential and utility markets. As lighting technologies have advanced over the years, Cooper Lighting has been at the forefront of the industry in helping businesses and communities leverage the latest technologies to improve efficiency, reduce costs and enrich the quality of the environment.